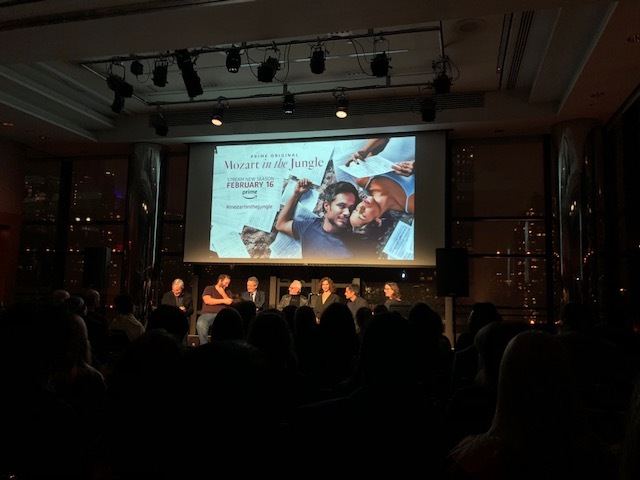 Last night, I had the opportunity to attend a season 4 preview for Mozart in the Jungle. The event took place at Lincoln Center’s Stanley H. Kaplan Penthouse, providing elegant views of a fog laden Manhattan. The event, sponsored by Amazon Prime and Lincoln Center Young Patrons, began with a light reception followed by press and photos with the cast. It then segued into a back to back viewing of episodes 1 and 2 of the new season. As always, Gael Garcia Bernal stole the show as the free spirited and carefree Rodrigo. Malcom McDowell and Bernadette Peters continued to shine as the back-up comic relief who stoke the fire just enough to move the story along. Episode 2 took us deeper into the past of Lola Kirke’s Hailey. And while we don’t quite begin to love her, we start to understand the pieces of her past that have made her who she is. The screening was followed by a Q&A with the cast. This was not the most enthralling conversation, but it provided some insight into who they are as people and the motivations and inspirations for the show. This season promises a healthy dose of laughter, mainly courtesy of Bernal and McDowell, and a few sides of realism that keep the show fresh. I am looking forward to binging the rest of the season when it becomes available through Amazon Prime on Friday, February 16th. This entry was posted in television and tagged amazon prime, bernadette peters, gael garcia bernal, lincoln center young patrons, lola kirke, malcom mcdowell, mozart in the jungle.